Haga clic aquí para leer este mensaje en español! 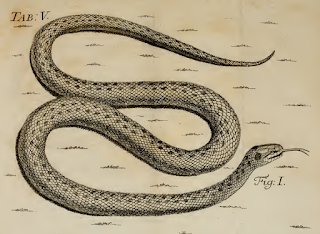 Last month I wrote about "serpentine royalty": the first species of snakes to be formally described using the Linnaean system—those described by Linnaeus himself in the 1758 10th edition of Systema Naturae. Out of 100 snake species in that tome, let's take a closer look at the royal among royals, the four that still bear their original names. Infographic showing the "tenure" of 807 snake genera used by more than one taxonomist. An additional 387 genera used only once are not shown, for a total of 1,194. Of these, about 500 are currently in use. The three longest lines at the top are the original three genera coined by Linnaeus in 1758 and still in use today. 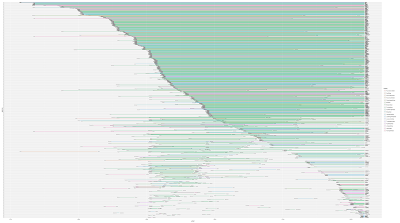 Data span 1758-2010, from The Reptile Database. In the immortal words of Jeffrey C. Beane: "Linnaeus first gave me my scientific name, but reflecting upon it, I think: “What’s his game?” Perhaps he was drunk on that day (or smoked pot), for a snake I am, yes, but constrictor I’m not." that have gone by the same scientific name since 1758.
were recently reallocated to it from Masticophis. of which only C. constrictor remains. Many contemporary naturalists have been puzzled by the scientific name of the North American Racer, which normally crams its live prey into its mouth rather than constricting it. Linnaeus's descriptions ("Inhabits Canada. Triangular head1. It approaches men, twisting itself around their feet, but it is harmless. "[10th ed. ]/"Inhabits North America. Runs swiftly and bites very hard, but is not poisonous. Twists itself around the legs of such as approach it. Very smooth and slender. Black, pale blue beneath, white throat. "[12th ed.]) glibly paraphrase that of his student Pehr Kalm2, who gave a several-page account of racers in his 1753 book Travels in North America. Among other myths, Kalm recounts tales told by "numbers of credible people" that racers, especially males interrupted during mating in the spring, will chase and trip people, but he was unable to reproduce the behavior despite his best efforts, saying "I know not for what reason they shunned me, unless they took me for an artful seducer". He was also doubtful of the claim that racers and other snakes enchant or hypnotize their prey, but he was reluctant to discount the possibility entirely because "many of the worthiest and most reputable people have related [the story], and...it is so universally believed here that to doubt it would be to expose one's self to general laughter." 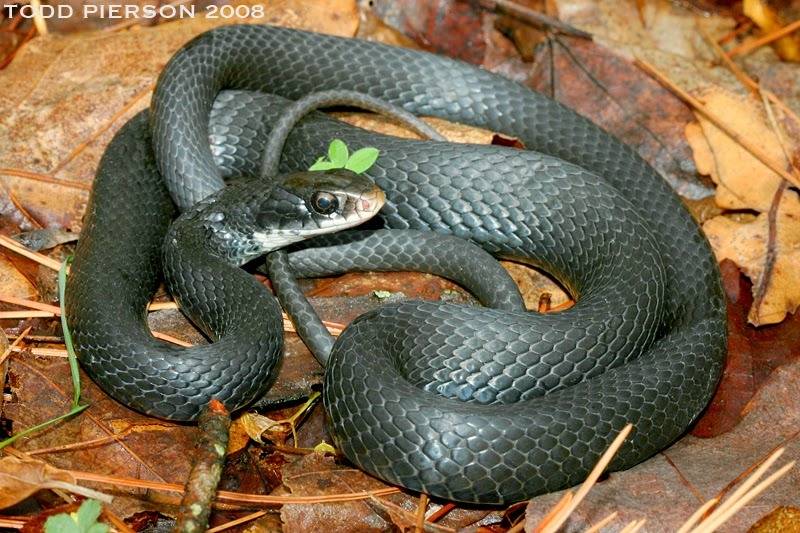 Given their willingness to accept these and other myths, it's not unlikely that Kalm and some of his informants, including the naturalists John Bartram and Cadwallader Colden, also confused racers with ratsnakes, both species being black along the east coast, which accounts for Kalm's descriptions of racers constricting and climbing large trees to eat birds' eggs, and might explain their perpetual misnomer. Racer plate from Catesby's Natural History. suggesting that perhaps he too confused ratsnakes and racers. 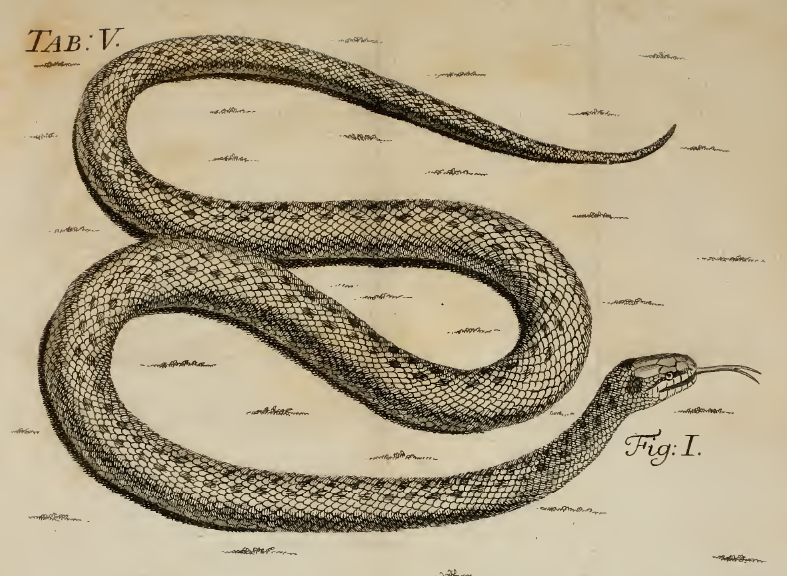 The English naturalist Mark Catesby3 had previously described racers, which he called Anguis niger, and other snakes in his 1731 Natural History of Carolina, Florida and the Bahama Islands, the first published account of the flora and fauna of North America. Apparently Linnaeus didn't think much of this book, because he dismissed it in his introduction to the reptiles by writing "Catesby sketched a few serpents more beautifully than he made notes about them". He must have had some respect for Catesby, though, for he named both the lily-thorn Catesbaea and the bullfrog Rana catesbeiana after him. It is a bit of a mystery where the racer specimen that Linnaeus saw originated, or if he even saw one. If he did, it must have been collected and sent to him by Kalm, but the whereabouts of Kalm's specimens of North American snakes, if they exist, are unknown. There is a specimen of a racer in the Royal Museum in Stockholm which is marked with a Linnaean label. An 1802 catalogue states that the specimen came from the King, but of all the snakes with these labels it is the only one Linnaeus does not describe in his 1764 manuscript on the King's collection, Museum Adolphi Friderici (where the binomial system is used for the first time), so this information is probably erroneous. Also described by Linnaeus but subsequently lost are Kalm's specimens of Northern Watersnakes (today, Nerodia sipedon) and Common Gartersnakes (today, Thamnophis sirtalis), as well as two more mysterious specimens which Linnaeus named Coluber leberis and Coluber ovivorus4. Unlike racers, this snake is the eponymous constrictor. The name boa comes from the Latin boa for ‘large snake,’ after an animal mentioned in the Natural History of Pliny the Elder, which ate cows ('bos' in Latin). Linnaeus, whose descriptions were written in a kind of telegram style, without verbs, in a deliberate effort to be as brief as possible and save space, was particularly laconic if descriptions had already been published by himself or others. 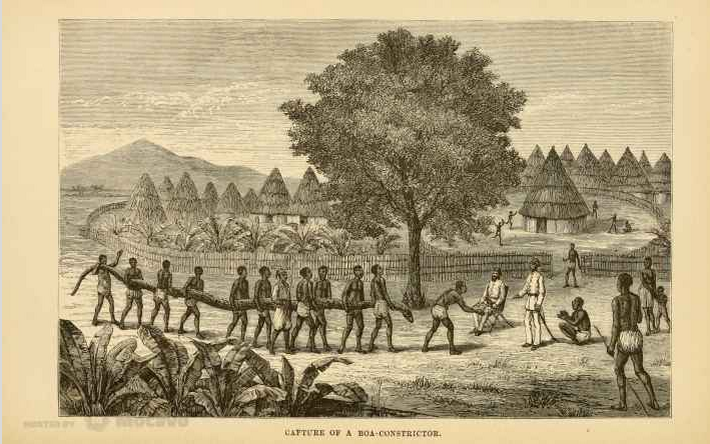 Of this species he said only that it "inhabits the [West] Indies and warm parts of the Americas", because boa constrictors had already been described by two of his primary sources on snakes, the Dutch naturalists Albertus Seba and Laurens Gronovius. Additionally, a specimen collected in Surinam by Claes Grill reached Linnaeus in the 1740s, and is described and illustrated in a dissertation defended by Peter Sundius, one of Linnaeus's early students. The catalogue of the King of Sweden's natural history collection also contains a description of one. However, Linnaeus could have been even more succinct had he recognized that a dark-colored specimen from the collection of Charles de Geer, a Swedish entomologist, was also a Boa constrictor. This collection was also the source of his anaconda, Burmese Python, and a handful of other snakes he had seen nowhere else, all of which are now in the Royal Museum in Stockholm, but he did not recognize that the boa in de Geer's collection was the same species that he had already called Boa constrictor. The caption reads "Capture of a Boa-Constrictor"
The confusion may have arisen because de Geer's specimen had many more ventral scales than other boas Linnaeus had examined. Linnaeus preferred to use the number of ventral and subcaudal scales to distinguish species of snakes over their color or pattern (like his quantitative sexual system for classifying plants, Linnaeus's methods were a predecessor to modern ones), but he recognized that even these scale counts varied considerably within species. Kalm stated that his teacher thought "it was better to make use of an imperfect character than none at all" and he was hopeful that "time, and greater acquaintance with this class of animals may perhaps clear up their natural characters". Linnaeus named Boa constrictor earlier on the page than Boa orophias, which is why we use the former name rather than the latter, which is now used for a subspecies from St. Lucia. In his defense, Linnaeus did write of B. orophias: "Face of the constrictor, but dark", suggesting that he thought they might be the same snake. To Linnaeus's terse description, Gmelin, writing in the 13th edition of Systema Naturae, added: "beautifully variegated with rhombic spots, belly whitish" and noted that it is "of vast strength and size, measuring sometimes 12 yards long, and by twisting itself round the bodies of deer, leopards, and other larger quadrupeds, breaks the bones, and after covering them over with a slimy mucus gradually swallows them". Certainly these descriptions helped popularize these large and impressive snakes, specimens of which were curios of the highest value. This popularization led to many explorers and travel writers calling any large snake a boa constrictor (including pythons) for centuries to come. Rattlesnakes have captured the attention of Europeans ever since they first started settling the New World. Using their Nahuatl (Aztec) name, Teuhtlacocauhqui, Francisco Hernández described them in his 1615 Quatro Libros de la Naturaleza: "When they strike, the bite is fatal unless treated promptly...It has a tail with rattles, one for each year of its life...It has two curved fangs in its upper jaw to inject its venom...It moves in a slithering fashion. Indians hunt and capture them and hang them around their necks...Those who raise them at home say they can live for up to a year without eating anything...When wounded and angry, it whips around, shaking its rattles, and raises its neck to frighten those nearby. However, it does not bite unless provoked." 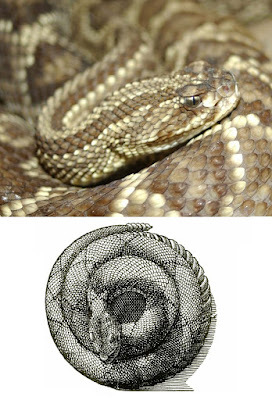 Hernández's book also contains the earliest illustration of a rattlesnake, which is certainly Crotalus durissus. Many other 16th and 17th century authors also wrote about rattlesnakes, dating back to their earliest mention in print, by Cieça de Leon in 1554. Many of these writings contain both accurate information and the first printed iterations of several still-current myths. Clearly, native Americans had known of rattlesnakes since ancient times; the Aztecs and Mayans had a rattlesnake constellation which may have been part of their zodiac. Because of their tails, Linnaeus thought that rattlesnakes were so unusual that he placed them in their own genus, Crotalus, separating them from other vipers (which he placed in the genus Coluber despite their solenoglyphous fangs). Linnaeus described three species of rattlesnakes: Crotalus horridus (see below), C. durissus, and C. dryinas. 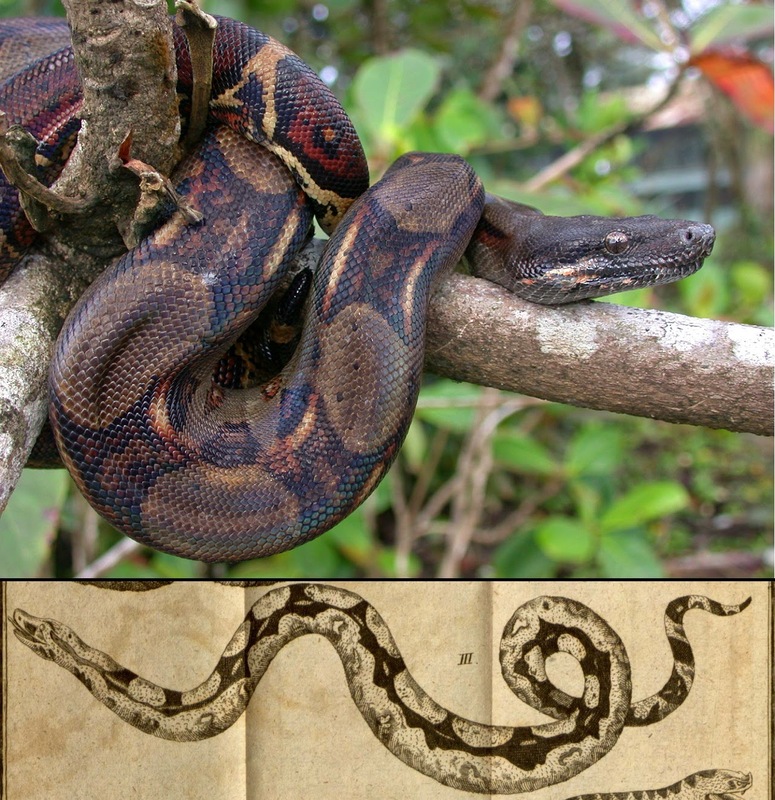 Like Boa constrictor and B. orophias, we now consider the latter two species to be the same, but unlike the boa names we use the name durissus for the species even though dryinas precedes it on the page5. 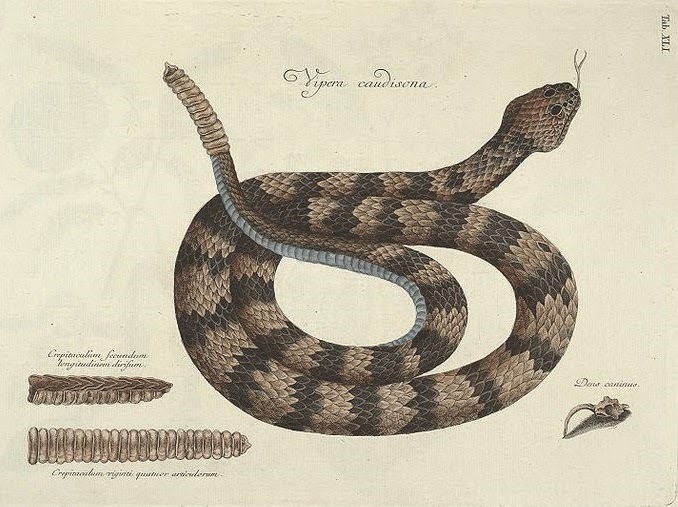 Although most rattlesnakes are North American, Linnaeus's C. durissus specimen was collected by Claes Grill in Surinam and originally described in detail in 1748 in the same dissertation that contained the boa constrictor description. 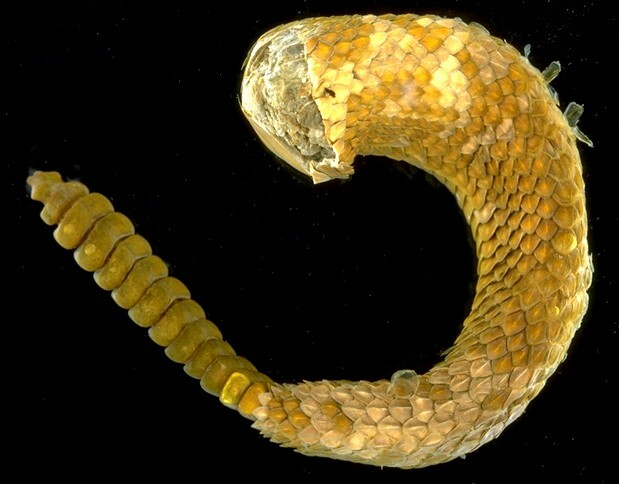 In contrast, the "C. dryinas" specimen was from the king of Sweden's collection and lacked geographic data. It is clear that King Adolf Frederick was not the most attentive curator—his curatorial record is incomplete, and over time many of his specimens have been lost and their labels mixed up or deliberately modified. He wasn't the most assertive head of state either, described as "little more than a state decoration"—although apparently he did like snakes. Both rattlesnake specimens from his collection that Linnaeus examined have apparently been lost for over 100 years, and the Grill specimen is lost as well. As a result, and because Linnaeus's descriptions are so terse, the names of the three rattlesnakes (horridus, durissus, and dryinas) were for many years confusingly and inconsistently applied. 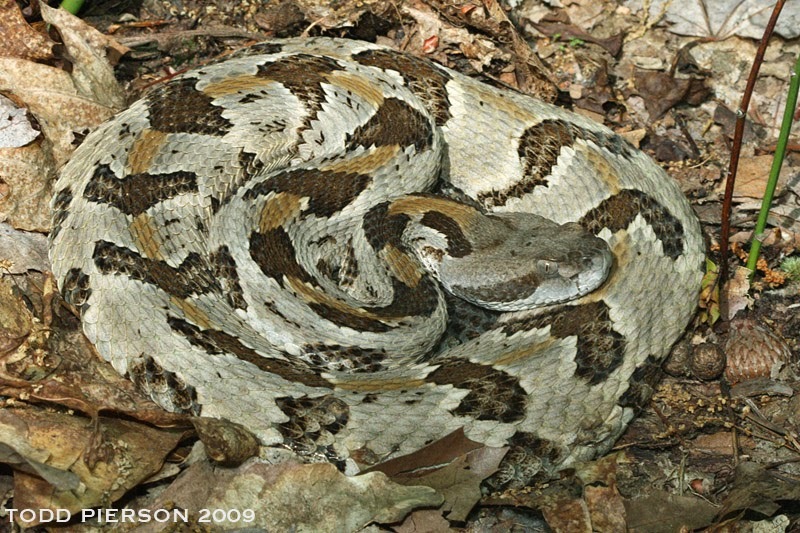 For example, both Holbrook and Duméril referred to the timber rattlesnake as C. durissus in their respective classic works, Duméril additionally called the neotropical rattlesnake C. horridus, and Boulenger refers to the eastern diamondback as C. durissus in his catalogue of snakes in the British Museum. which today contains 39 species. caudisona, but which Linnaeus and we call Crotalus horridus). Kalm considered this "an incomparable illustration". Although Kalm did not collect a rattlesnake for Linnaeus, he gave a lengthy, detailed, and incredibly accurate description of rattlesnakes and their relationship with humans, which is as much an account of snake biology as it is of the cultural history of colonial America. His words suggest that rattlesnakes were already on their way out in eastern North America in the mid-1700s: "In all my travels, I saw only 3 living specimens. I frequently heard them in the nearby thicket, but it seemed inadvisable to pursue them." It is a testament to Kalm's scientific training that he surpassed many modern observers in accurately stating that "The snake is usually 3 to 4 feet long. The largest one I saw was 6 feet long and as thick as the calf of a man's leg. Usually they are as thick as the wrist" and "They travel slowly, thus one need not fear being overtaken" and "The rattler is peculiar in that he usually does not injure a person unless forced to defend himself." 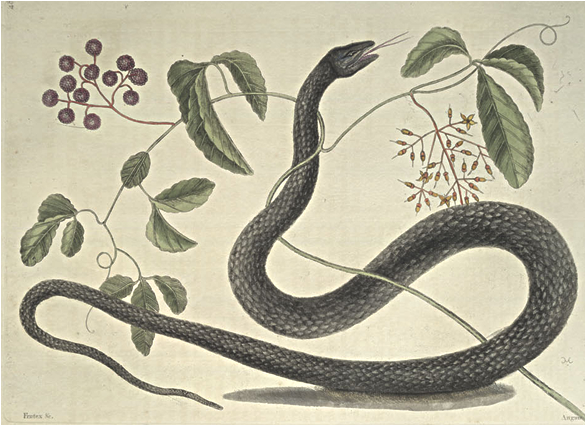 Despite these honest observations, Kalm had no special love of snakes, including them in a list of reasons that he preferred Sweden to America: "The rattlesnakes, horned-snakes, red-bellied, green, and other poisonous snakes, against whose bite there is frequently no remedy, are in great plenty here". Catesby also described the Timber Rattlesnake, which he called Vipera caudisona, at length. Gmelin, writing in the 13th edition of Systema Naturae, expanded Linnaeus's description in both inaccurate ("The most venomous of the serpent tribe") and accurate ("They seldom bite unless when irritated, or for the purpose of securing their prey, and the fascinating power which has been attributed to them is probably nothing more than that they first bite the animal and patiently watch till it dies to devour it") ways. 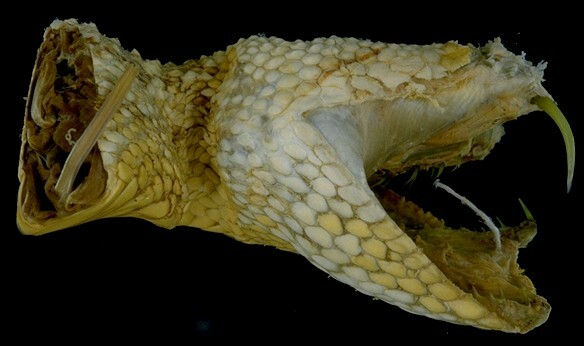 In 1754 in Museum Adolfi Frederici Linnaeus wrote: "...nor can he escape with life who is bitten by the Rattle-snake (Crotalus horridus) in any part near a great vein. But the merciful God has distinguished these pests by peculiar signs, and has created them most inveterate enemies; for as he has appointed cats to destroy mice, so has he provided the Ichneumon [mongoose] (Viverra Ichneumon) against the [cobra], and the Hog to persecute the latter. He has moreover given the Crotalus a very slow motion, and has annexed a kind of rattle to its tail, by the motion of which it gives notice of its approach; but, lest this slowness should be too great a disadvantage to the animal itself, he has favoured it with a certain power of fascinating squirrels from high trees, and birds from the air into its throat, in the same manner as flies are precipitated into the jaws of the lazy toad." Linnaeus described 83 other snake species between his 10th and 12th editions that are still considered valid today, plus 31 that are not (including Crotalus dryinas and Boa orophias). These include many familiar, widespread, and notable species, including 2 scolecophidians, Anilius scytale, and an Asian pipesnake from Sri Lanka (all of which he placed in the genus Anguis, which we today use for legless lizards), several huge constrictors including the Indian Python, Boa Constrictor, and Green Anaconda (but also three smaller tree boas and two sand boas, the latter also in Angius), 13 vipers including the fer-de-lance, copperhead, European adder, bushmaster, and pygmy rattlesnake, a pair of homalopsids, 46 colubrids (including many familiar European and American species but also an African egg-eater and an Asian flying snake), 5 lamprophiids, and 9 elapids (including 3 cobras, 2 coralsnakes, and 2 sea snakes). He also made a few brief comments about snake anatomy and biology as footnotes or in his introductory material, including his method for counting ventral and subcaudal scales (first used in Amphibia Gyllenborgiana and still in use today) as well as the correct observations that "Serpents of our country hibernate and in the early spring shed their skin, that is to say, their old age" and "Serpentes often swallow down prey twice as thick as their neck, on account of their expandable, unarticulated jaws". In other works, he presents a great deal of information on snakebite and, the consummate botanist, its treatment using various medicinal plants. Although Linnaeus bore no special love for snakes, he treated them as he did other biodiversity, and I encourage all modern biologists to do the same—to view snakes as wildlife rather than pests, as a beautiful and diverse part of our natural heritage, to see them as what they are rather than what we imagine them to be. It is tempting to imagine Linnaeus as a brilliant solitary taxonomist, aided and sent specimens by his correspondents, colleagues, and students but intellectually working alone. But, as today, Linnaeus relied heavily on his network both to obtain specimens and to describe them with reference to those who had gone before. 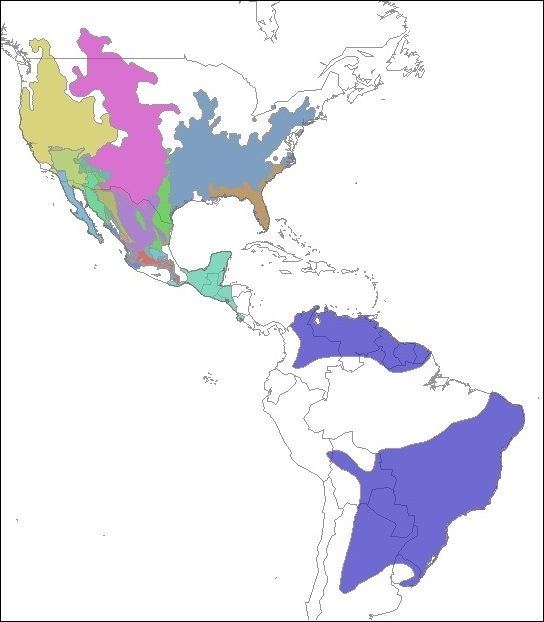 Of the 74 species in the 10th edition, only four were brand new original descriptions (these were Vipera aspis from southern Europe, Epicrates cenchria from South America, Erythrolamprus triscalis from Curaçao, and Duberria lutrix from Africa), and the 12th contained scarcely more, mostly southeastern North American species sent to Linnaeus by Alexander Garden. Almost ten times that many new snakes were described last year alone. It's probably safe to assume that Linnaeus described every snake he ever saw, since this is what he did with everything else. And, considering he lived in Sweden most of his life and never traveled further south than Germany, he did pretty well, nailing numerous tropical species of snake collected by others and sent either to him, or that he examined in the collections of zoologists in Germany, England, and Holland. Systema Naturae contains snakes from every continent except for Australia, which was only just becoming known in Europe at the time of Linnaeus's death (his correspondant Joseph Banks and two of his apostles, Daniel Solander and Anders Sparrman, sailed around the world with James Cook and visited Australia and Oceania in the 1760s and 1770s; Linnaeus's health was poor throughout the 1770s and he died in 1778). But, there is one glaring oversight in Linnaeus's snake work: he described only two of the three native Swedish snakes (Natrix natrix and Vipera berus). Both of these he initially described in his 1746 Fauna Svecica, an account of the animals of Sweden containing 1,357 species in its original edition (upated 1761 with 2,266 species), in which he used cumbersome pre-binomial names such as Coluber natrix scutis abdominalibus CLXX squamis caudae LX ("Water snake with 170 ventral scales and 60 subcaudal scales"), which later became the much simpler yet no less unequivocal Coluber natrix in Systema Naturae. But he missed one: the smooth snake, Coronella austriaca, which was described by J.N. Laurenti7 and named for his native Austria (where it is also found) ten years after the 10th edition of Systema Naturae. Did Linnaeus ever see a Coronella in all the years he lived, worked, and botanized in Sweden? Smooth snakes are active during the day in dry, sunny clearings where they bask in bushes, and although they are not found as far north as Uppsala, they do occur in Småland, where Linnaeus grew up. It seems likely that Linnaeus would have seen them—did he think they were the same species as another kind of snake? If not, why did he leave them out of Fauna Svecica and Systema Naturae, which were intended to be as comprehensive as possible? Thanks to Todd Pierson, Patrick Jean, and JD Willson for the use of their photos, and to my mom for getting me William Blunt's Linnaeus for Christmas this year, which inspired this article. Regarding note 5, the current view is that there's no such thing as 'page priority' for competing names coined in the same publication (i.e. with the same date). Usage would now be settled on a 'first reviser' basis. Thanks John! I didn't know that about page priority. I'll read up on the 'first reviser' principle and perhaps add an edit if I think it can clear things up. Some of the references I consulted indicated that page priority was in effect in these cases, so I went with it. Agreed that Paroplocephalus is accepted, but the data set that I used (TRD 2010, available on FigShare at the link above) called the species Echiopsis atriceps, although Paroplocephalus was listed as a synonym. No more recent data are available for download, so I couldn't bring the graphic up-to-date. I'm sure there are more errors. Hey, hi, could you tell me where I can find the article from yo take the map of Crotalus distribution? thanks! Hi Elizabeth, I made the map myself using shapefiles from the IUCN (linked in the caption).